The table below demonstrates some of the most important features an ERP solution can offer, divided into ten categories: Sales, Customer Relationship Management, Accounting & Finance, Marketing, Warehouse Management, Manufacturing, Purchasing, Services & Projects, Human Resources and Usability & Productivity. These categories encompass almost everything an SME might need to manage, develop, and evolve its business operations. 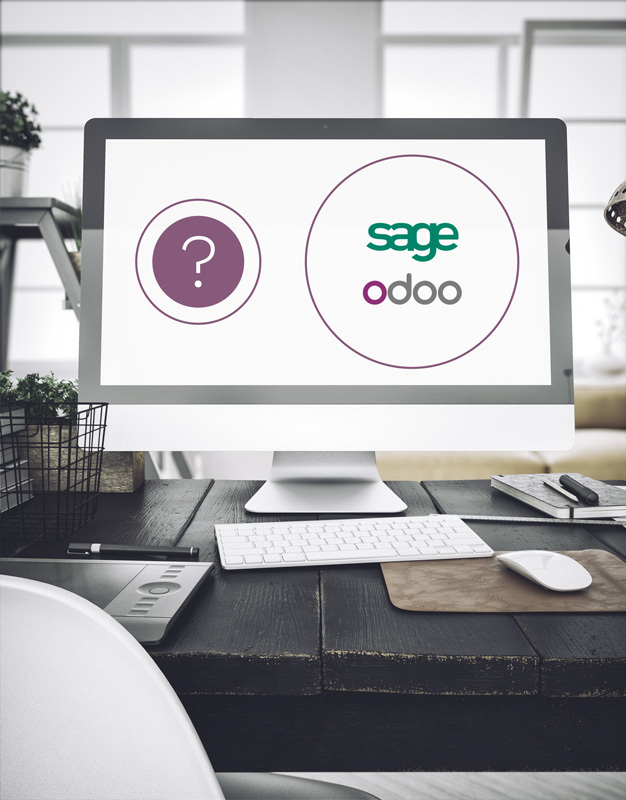 The comparison will demonstrate the availability of these features with detailed analysis for Odoo vs. Sage. Sage 100 Entreprise i7 offers different modules in the main categories: Sales, CRM, Manufacturing, Accounting & Finance management. Dedicated to SMEs, Sage 100 Entreprise i7, fits the new working practices and allows more flexibility. For Sage, the implementation service is usually provided by a local partner. For Odoo Online, implementations are usually provided directly by the vendor. Odoo Enterprise implementations (the on-premise offer of Odoo) are typically performed by a local partner. The implementation cost of Sage is usually case by case and prices differ widely from one project to another. Odoo however has packaged implementation offers (between $2,100 and $5,500 for a standard implementation). Most of the offers through Sage cover one year. Odoo’s default offers are monthly, without commitment, and typically includes a 16% discount with a yearly contract (paying for 10 months instead of 12). The following graph was created with the Explore tool on Google Trends. The color curves show the number of Google searches for the associated keywords. 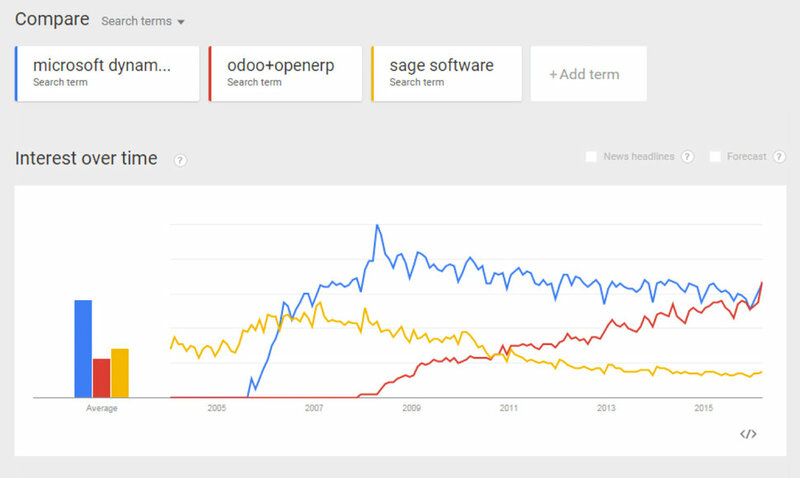 This metric shows the relative consumer interest in each software platform. Often SME’s will find they have a software need but are unable to implement one given the high level of overhead and complexity of the task. For growing companies, it is much more optimal to start small in a software solution and add new features little by little as the business expands and evolves. In most practical cases, a flexible and modular approach works best for SME’s as it provides the business with the necessary freedom to adapt to change quickly. Business needs will never stop fluctuating, especially in a growing company. Traditional practices for SME’s are now becoming obsolete as more powerful and dynamic solutions become available. Selecting the best option is no longer just about which best suits your business today, but also which is best for your business in the future. Planning for long term success with an easily adaptable software solution can be the key decision in the long-term developement and growth of your business. This whitepaper was compiled by Odoo SA. We did our best to make it objective and fair. If you find a mistake or a missing feature, please report it to feedback@mail.odoo.com and we will update this document. Our goal is to have a continuously updated comparison of the main competitors to be as accurate as possible.